Saturday night I had trouble sleeping so I was not up in time for my usual Mass at St. Anthony's. Instead I went and heard Mass at Our Lady Help Of Christians, my emergency church, which I love. I have already described Our Lady Help of Christians because it fascinates me. The Mass there, adding to its appeal, is very convenient to the Union Road Goodwill. You are allowed to shop on Sunday if it is a charity! Well, that is what I think anyway. I hope I am not wrong because it is too late now. The Mass was really interesting because instead of following the agenda for this particular Sunday, they celebrated the feast of St. Michael the Archangel, which was Saturday. The priest did his sermon on angels. How great is that? 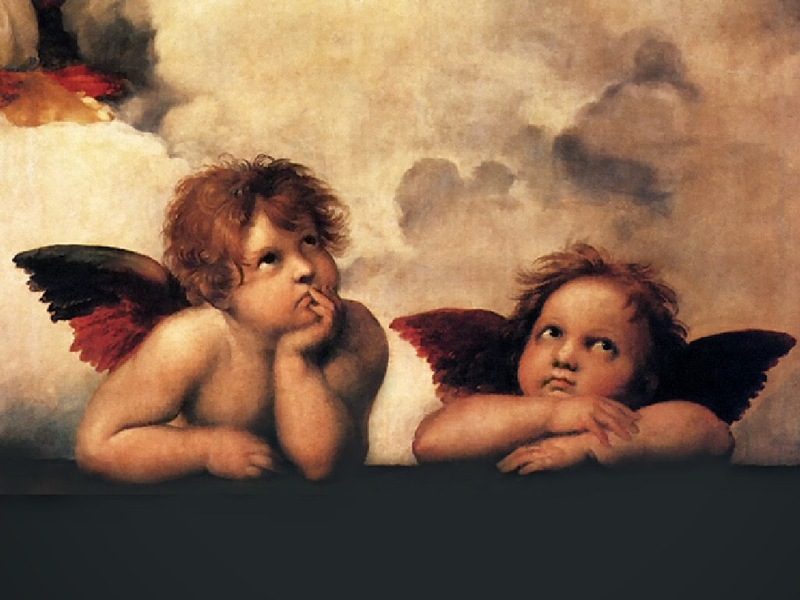 As he said himself, the Catholic Church hardly ever talks about angels any more. Then he said, every time some people in the Catholic Church throw something out, the rest of the world picks it up. Chant was like that, he said. So are angels. Now you go out and angels are everywhere, as he said. You can buy little figurines of them in stores. This is me talking now and not the priest, but here is where we get to the trouble with angels: Because of this kitschy treatment of them, people going around confusing angels with fairies or whatever. And there are also people going around saying that you become an angel after you die. That is not how it works! Leonard Pennario died but he is not an angel. He is still himself! Angels are not human. They never were human. They are spirits. The real St. Michael is so much more fascinating and frightening than anything anybody could make up. This is something I love: At the Tridentine Mass there is a part that mentions that St. Michael is present at the right hand of the altar. He is with us and we are communicating with him. That always thrills me. I find myself looking to the right of the altar thinking I am going to be able to see St. Michael there. At St. Michael's you do see St. Michael there! Anyway it broadsided me with how good this Mass was. This priest, I think he is from St. Casimir. He said all the prayers so we could hear them, another thing I liked. I do not like things rushed. This was a terrific Mass! And after it I did stop at Goodwill and I did acquire a few things, which I will disclose another day because I have already run on too long. Meanwhile, please join me in this condensed version of this classic '60s movie. Bing, I do too! I always get weepy at the end when Hayley Mills makes her big announcement.